It’s the time of year that beckons comfort food; hearty pastas, squash of all types, casseroles and creamy soups. With that comes a load of calories as well – and if you’re like me, you’re not at all active in the winter, so chowing on all that yummy food tends to add up and leave you feeling a bit sluggish come spring. Pace yourself through the season with this salad – it has the best of both worlds. 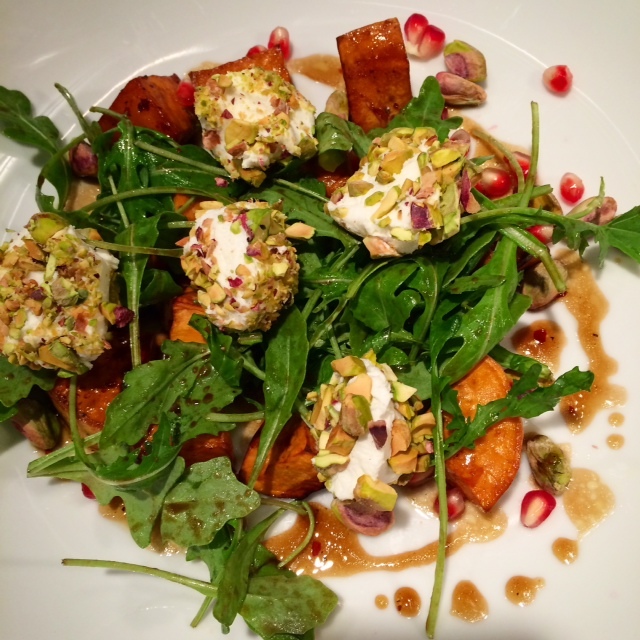 The sweet potato is the star giving substance and when paired with the crunch of pistachios two ways, the tang of goat cheese and the snap of pomegranate, this is a salad that eats like a meal without making you feel like you over indulged. I adapted this recipe from a find in an old issue of Wine Spectator. 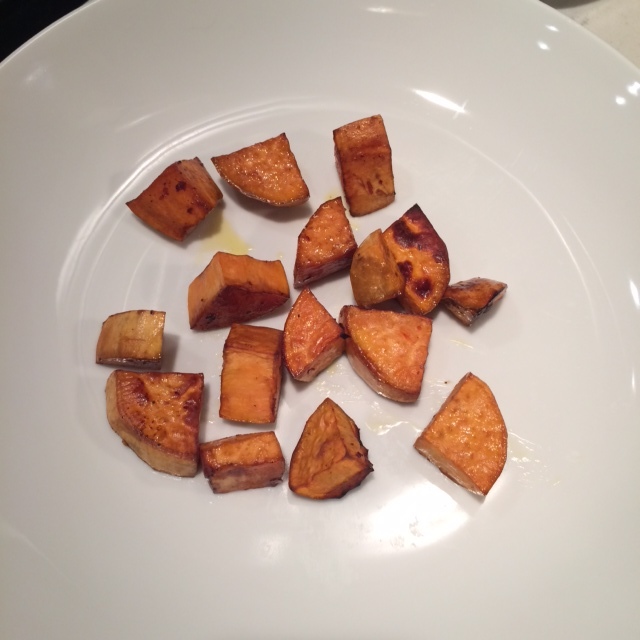 The original recipe calls for butternut squash, but I find sweet potatoes a little easier to work with and they taste just as good. The recipe also calls for pancetta, so for you non-vegetarians out there, feel free to add this ingredient in (The recipe calls for 4 oz). I usually make this for dinner and serve slightly heartier portions, but this also makes a great lunch. 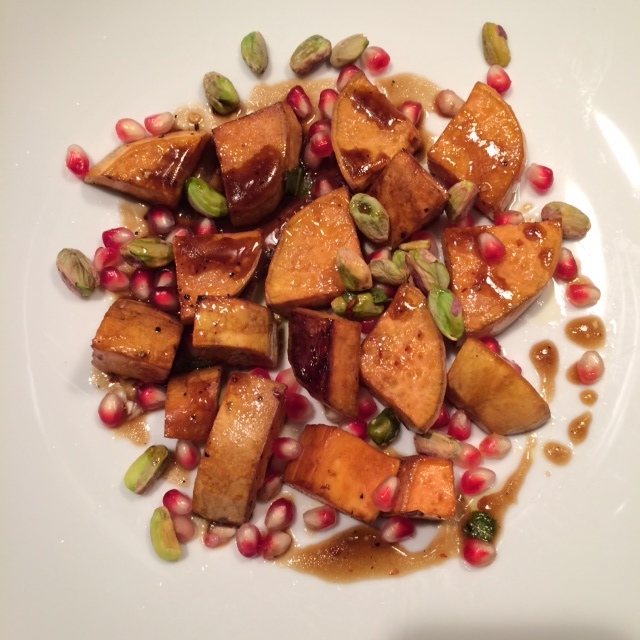 Embrace the fall while still hanging on to light summer food! Finally, top with the greens and goat cheese and serve! Preheat the oven to 475 F. Combine the first seven ingredients in a medium bowl and whisk until emulsified. Reserve. Peel the potatoes and cut into bite sized chunks of similar size. Place the potatoes in a large bowl and toss with half of the vinaigrette mixture until coated. Place the potatoes on a non-stick sheet pan and cook in the oven for 10 minutes. Using a tong or spatula, turn the pieces over and cook in the oven until tender, about 10 to 15 minutes depending on the size of the potatoes. Spread the chopped pistachios on a small plate and place small spoonsful of the goat cheese on the chopped pistachios. Reserve. To serve, arrange the potatoes on salad plates. 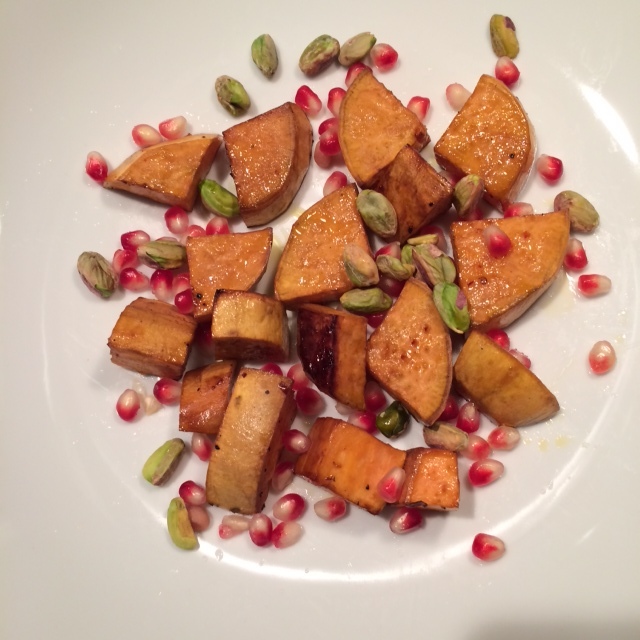 Divide the pomegranate seeds and whole pistachios among the plates. Spoon 1 teaspoon of vinaigrette over the ingredients. Place 3 pistachio covered goat cheese mounds on each plate, pistachio side up. In a large bowl, dress the greens with the remaining vinaigrette and evenly scatter the greens over each plate.